Page Reporting provides deep insights to help you identify the content that drives business results. 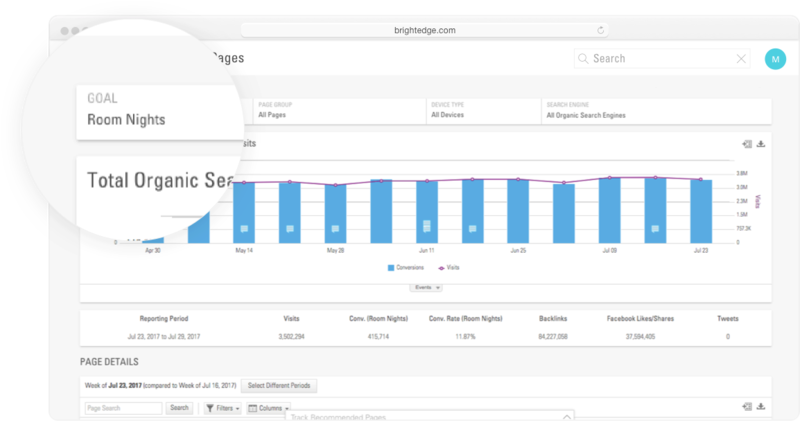 Slice and dice the data to develop page-level insights, or click to review detailed SEO recommendations, thanks to the power of the BrightEdge platform. Use Page Reporting to identify and measure the content that drives performance/conversion. Blend in web analytics data to learn how SEO investments impact traffic, conversions, and revenue site-wide – either by content category or at the individual page level. Find out the content that drives the lion’s share of your website revenue. Analyze how efficient different page groups are in completing their own conversion goals. Assess how engaging your content page or page groups are as measured by website visits, time on site, bounce rate, and more. You can view content performance across desktops, smartphones, and tablets. 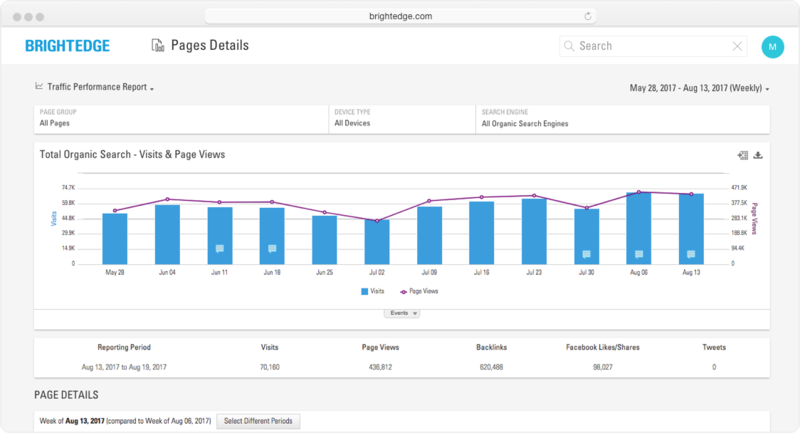 Gain page URL-level insights on search ranking, backlinks, social signals, and website metrics, such as conversion rate. Customize your view with column field chooser, and save your data view by directly adding the chart to StoryBuilder dashboard for faster access in the future. 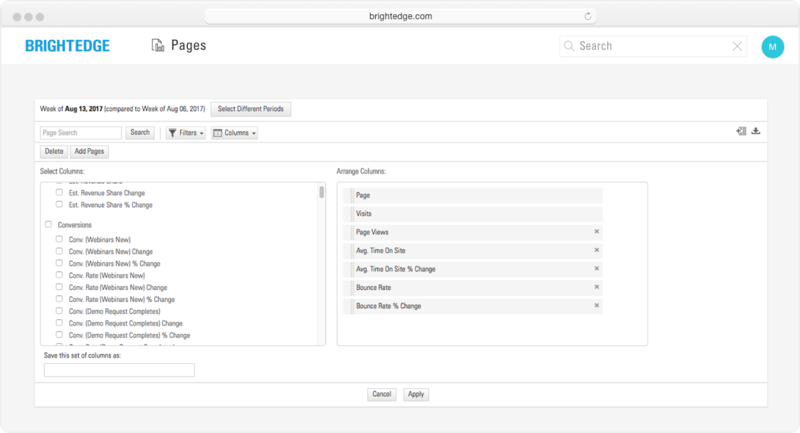 Ready to learn more about Page Reporting and the rest of the BrightEdge platform? 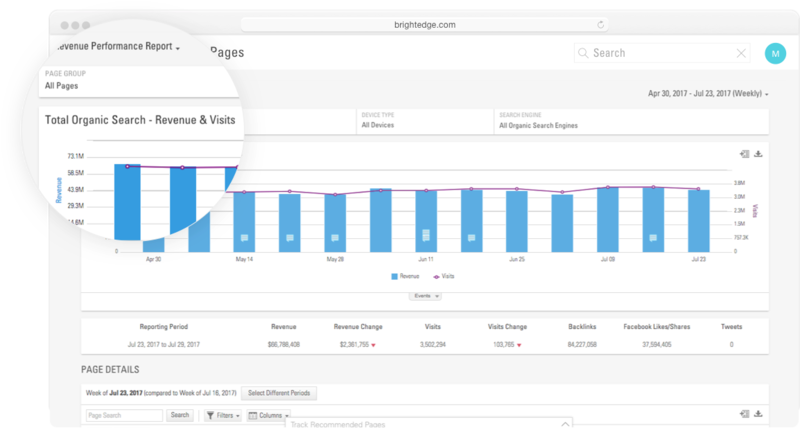 Discover high revenue generating pages to track SEO plans within Page Reporting. Review automatically created page events to correlate content changes with page revenue improvements. 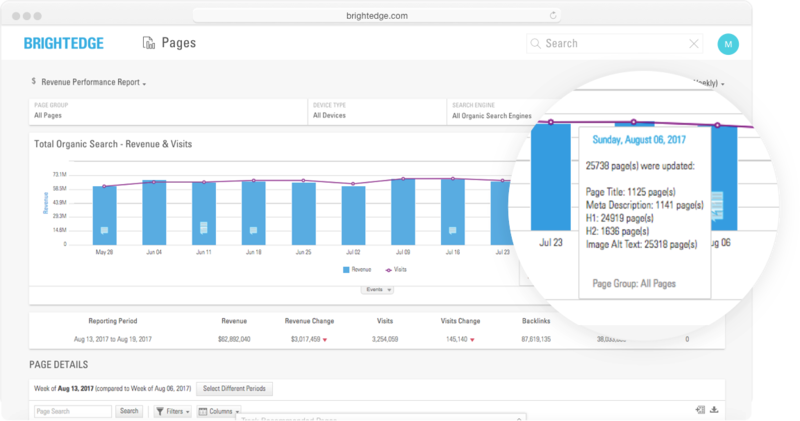 Create Anomaly Detection alerts when BrightEdge detects on-page element changes. Easily access optimization recommendations. Add Page Reporting charts into StoryBuilder dashboards for high-level performance analysis. Track performance of every keyword associated with a page, then dig into Keyword Reporting for more insights.